I have, I think, put the finishing touches on another element of the new design for this website: the print stylesheet. One of the things I wanted to do when I first transitioned this site to a CSS based design was to optimize the print experience as well as the online experience. CSS, through using stylesheets linked for media="print", allows you to specify alternate presentations of your pages for print purposes without having to change your underlying HTML or forcing the user to choose a “print friendly” view. The print stylesheet for Jarrett House North now suppresses all the navigation elements, gives a reduced size version of the site logo, and (on browsers that support it, such as Gecko-based browsers and Safari) prints the full hyperlink as text next to each link. Give it a whirl—I think you’ll like it. For now, the regular print-friendly link will remain on every page, for print-friendliness on browsers that don’t offer full CSS compliance. But you no longer have to do anything special to get that print friendly feeling. One interesting implementation thing I learned in the process. I couldn’t figure out how to dynamically resize the banner image and provide alternate text that I didn’t show in the main template, so I created a DIV that is hidden by the default stylesheet (by setting display: none;) and shown in the print stylesheet. Or at least, that was the intention; the first few times I made the change, the print version of the banner never showed up. I finally figured out that the default stylesheet’s rules are applied to the print content, then overridden by the print stylesheet’s rules. So rather than just redefining the div, I had to actually specifically override the display property by setting display: inline;. Once I did that, I was golden. The main resource I used in creating the print stylesheet was an article by Eric Meyer at A List Apart called CSS Design: Going to Print. I was overwhelmed with a bit of nostalgia for my undergrad days today and decided to go hunting for pictures. I found David Evans’ site and was blown away. Evans, who is on the Computer Science faculty at the University (and an MIT grad), has hundreds of photos on his site, including many astonishing (and astonishingly big) ones of the University grounds. 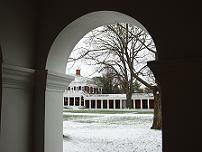 One of Evans’s photos of the Rotunda in snow is currently adorning my desktop; credit where due. A few quick ones. I’m working from home this morning, waiting for the slick ice on our hill to melt enough so that I don’t kill someone trying to go down to the office. I may have to leave anyway, though, as the power has flickered here more than once already. VC and startup guy Ross Mayfield is politicizing in a big way over the quiet passage of portions of the late unlamented PATRIOT Act II in the Intelligence Authorization Act for Fiscal Year 2004. He asks why we haven’t seen more media attention on this one. Did MoveOn even try to mobilize anyone around this issue? Interesting piece in the Economist (a rare article not behind their paywall) drawing the analogy between the coffeehouse revolutions of the seventeenth century and the information exchanges in today’s WiFi coffeehouses. While the piece is published without byline, but is written by the author of The Victorian Internet, Tom Standage. Putting redesign in perspective: I revisited the Browser Emulator at DejaVu.org to see what the new design looked like in NCSA Mosaic 1.0. It really wasn’t too bad. The one thing I have to work on is getting the same functionality and table-less layout while still having the content column load before the navigation column in older browsers. There’s occasionally a delay even in modern browsers before the main content appears as the navigation loads—not good.